TGIF! End to a full, long, interesting week. One thing I really love about my job is the variety it affords me. I never really know what will come my way each day. Since this is the last day for documenting I thought I’d try something a little bit different. Consulted with co-worker who was doing the morning duties. She was getting bounced back to beginning page of her account in HIP. Tried recreating it on my machine and she showed me on the Day End machine – still wasn’t able to recreate it. Chalk it up to computer gremlins. Got a phone call from the Glenwood branch manager regarding the email I had sent out asking them to cleanup the branch notices on Staff Intranet. Since my boss was out on vacation, I assigned the IT staff to their day at our Admin office for next week and posted the notice on our Staff Intranet. Worked on bounceback email notices – since this is such a tedious mind numbing job I decided to blip some Robert Palmer songs on blip.fm while I did this. Having great music to listen to helps! Emailed staff member who submitted a helpdesk ticket. Needed more information so I could solve her issue. Consulted with web programmer to see if he had any suggestions but agreed we needed more info before we could proceed. Children’s librarian came to my desk asking questions about burning music to a CD for children’s classes. I pointed her to the FAQ on our Staff Intranet with great instructions and screen shots. Got a call from HR dept. regarding publishing an announcement on our Staff Intranet. Children’s librarian came back up for some assistance with burning cd – went down and showed her how to add songs, delete ones you don’t want and move them so you get the order you want. Analyzed current navigation and started documenting what different departments use on Staff Intranet in hopes that this will help us set up better navigation for the new version. Saw a Tweet from @julie and realized I had missed T is for Training podcast. Logged into the chat area for the last 15 mins or so of the show. Got a call from hubby that severe storm had blown down 2 trees (turned out to be just very large limbs not the whole tree) onto our garage which houses his precious baby, a 1960 MGA. Took personal leave to go home and document damage for any insurance claims. Ah, day two and it should have started off better. Knew I had to leave a bit early from home to drop my son off at his Dad’s new house. Still trying to figure out best routes to and from his house. This morning with the hazy fog it didn’t help and I was a few minutes late getting to work. First one in the office this morning. Dropped my stuff at my work space and scurried to get to the morning duties (I had switched days with a co-worker). Unforwarded the helpdesk phone and then proceeded to swap the tapes on both the Horizon and Authority Works servers. This was to be my IT @ Admin day so I needed to focus on the morning duties and get them out of the way. Once logged into my Ubuntu and Windows machines I did a quick cursory check of email (no dire messages). I then proceeded to do the morning duties (just like yesterday). Once they were out of the way I checked the helpdesk tickets and assigned them accordingly to my co-workers (seems some days I get a lot and others I don’t – it all evens out in the end). Opened Twirl so I can peruse Twitter (both my personal account – @mlibrarianus and the library’s official account @HoCo_Library). Then I queued up a Tweet for the library’s account using TweetFunnel. Our Network Administrator came into the office and had mentioned that we had a power outage (clock in the workroom before ours was behind). PACs were showing red on PACMON (our own montioring system that our web programmer wrote) but luckily the Day End computer finished running Day End before the power outage (having to run day end in the morning before people start logging into Horizon is not a fun thing to coordinate). I proceeded to work on the email bouncebacks. I’m still amazed at how many we get. Are that many people really changing their email addresses and not updating them with us or what? Still trying to figure out the best way to ensure our customers get notified without this having to deal with bouncebacks. It is a labor intensive process that should not be handled by IT. Haven’t come up with the answer as I know that there isn’t a “one size fits all” solution. Out of the corner of my eye I saw a tweet that made me chuckle. I don’t normally follow the trends on Twitter but this one caught my eye #verydullbands. Some were pretty good. tumour seemed to be on a roll. 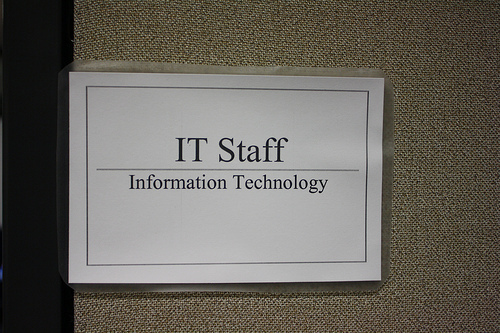 Time to head to our Administrative office in the East Columbia Branch and be the IT guru of the day (each of us takes turns spending a day at Admin helping with computer/software related issues that arise). 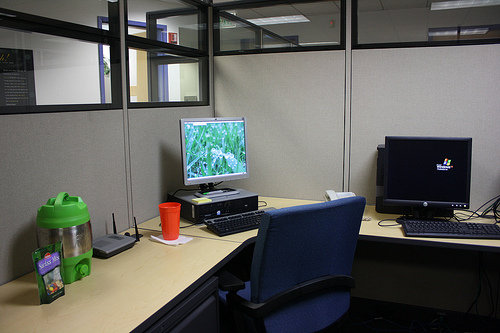 After getting my lunch in the fridge and things settled into the IT cubicle, I logged into the Ubuntu machine we have set aside for us. Last time I was there I used Good OS – as if Google and Mac had a love child this would be it. I really liked the operating system and having the Google gadgets. Alas I was back to our staff desktop version of Ubuntu which is nice too. Queued up another tweet for the library’s official account (which is approved by our Public Relations dept. and released to the Twitterverse). Talked to a colleague who had heard I’d been recently to Spain recently and was thinking of going. So I sent her a link to my photos from Espana on Flickr. Consulted with fellow IT co-worker about iTouch and our collaborative software, DeskNow. He had a Blackberry and wasn’t familiar with the iTouch. 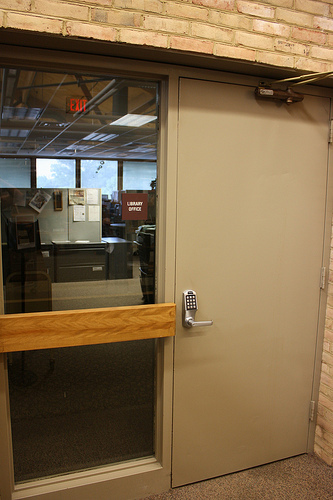 Went around the Admin office asking staff if they had an iPhone or iTouch. Found someone in Public Relations that had an iTouch who was able to help with the question another staff member had asked me. I won’t mention my extreme jealousy of those with the iPhone or Blackberry (I soooo miss my Blackberry). Helped another colleague with a PrintNow problem. Think the delay was due to her Java update message wanting attention. Once I clicked on that PrintNow printed the screen shot she needed. Stopped by the cubicle of our Training Coordinator to discuss a request that had come up in my visits to the branches regarding our Staff Intranet. She was open to the suggestion that the less formal “Lunch and Learns” be part of the training calendar as well as a notice on the Staff Intranet. Back to my cubicle. Checked on the Merlin site since I was playing admin while Nini Beegan was on vacation. Cleaned up a bunch of registered users that were clearly spammers. Consulted with web programmer and network administrator about the best way to get a new image onto our PAC screensavers. The library’s unofficial (yet very professional and wonderfully talented) photography, Fritzi Newton, had taken shots of each of our 6 branches along with iconic views of our county and mixed them with photos she was able to obtain from Enoch Pratt. She put these altogether as a screensaver for our public computers. There was wording on each saying where the photo was taken. After 2 years of these being out there for the public someone had realized that one of the slides had Maryland misspelled. Fritzi corrected this and gave us the new image (with correctly spelled state) to use. 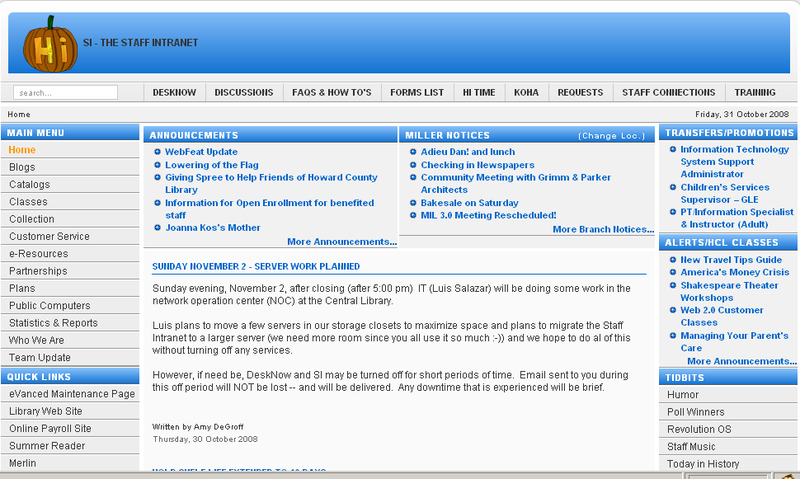 Realized I hadn’t really talked to our staff at Admin about the revamping the Staff Intranet. I had been to all the branches to get feedback so I wondered around the office and talked to different staff. Along the way I helped with a couple browser settings. The one feature that I love on our Intranet was one that I pointed out to several folks. Our web programmer had created a staff directory – the staff search box searches that directory. So if you don’t know what branch, the phone number, the exact spelling of their email, what title they have, etc you can search for a person (last name or first name or full name) and see all of that plus a picture. I convinced several people that using the staff directory search was 100 times easier than scrolling through the phone list. 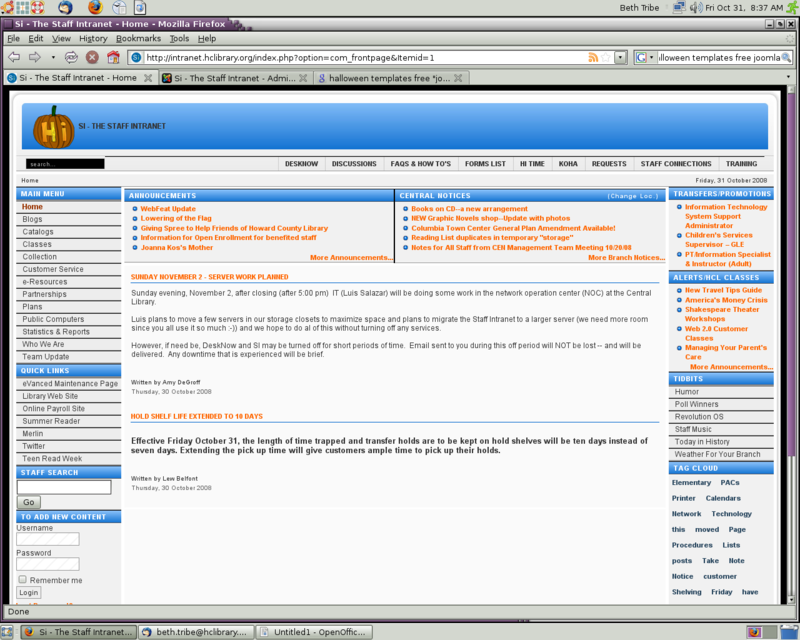 This made me realize that this well used by many but missed by some box needed a more prominent spot on our Intranet. So I moved that up further on the left hand side along with moving the Quick Links further to the top as well. These are just temporary stop gaps until we revamp the whole Intranet. Assigned to myself and closed helpdesk ticket regarding receiving spam from old email address. *sigh* The only 100% sure fire way to not receive spam is to not use email. Played telephone tag with the editor of our reader’s advisory blog, Highly Recommended, regarding a few tweaks and a new idea that had come up in a meeting. Then I went about interviewing more of the Admin staff about our Intranet and what ideas they might have. Dealt with calendar settings for two people in Public Relations. They didn’t have a box checked so the calendar invites were not showing up on their calendars the way they should. Debunked an Urban Legend that was sent via email to IT. I love Snopes.com. I used to hang out on their bulletin board and I do miss the folks from there. Discussed ideas with the Events & Seminars Manager about the use of voice recorders regarding local authors. Getting them to read excerpts from their books or interviews with them as part of a podcast. Answered an email from staff about the spam filtering option setting in our email. Explained that we use Barracuda, spam filter, on the main email server so there is no need to use the one provided by DeskNow (if you do it actually creates more work). Decided to make another change to the current Staff Intranet (that was brought up by staff at the branch) and managed to not screw it up. Deleted code and things still worked properly. Then I got a little too confident and removed some more – this time I did screw it up. THANKFULLY, our web programmer who has the patience of a saint with me was able to figure out what I did wrong and fix it. Way past time for me to go, so I turned off my machine and headed home. I had to pack and drive to PA that night since I going with my parents the next morning to the hospital. My Mother was having a biopsy of her lung done. Here’s hoping it all goes well and the results are good. Day 2 of week of keeping track of what librarians or library workers do so we can see the diversity of the jobs we do. 8:00 – finally got to work. Snowing in MD and for some reason took more than double my normal time to get here. 9:00 – Talked to boss and hubby to help me sort out feelings, fears, and concerns. 11:30 – hooligans threw snowballs at our 2nd story windows (right behind my desk). Inside joke – our Network Admin every year since he’s been at this location has thrown a snowball at the window. First couple of times we didn’t catch on that it was him. Now it’s just tradition and we humor him by accusing hooligans not him. 11:45 – worded email about ILL request for purchase and vendors we saw demoed the other day – Relais, AutoGraphics, OCLC and SirsiDynix. If I had to pick one right now based on what I saw it would be AutoGraphics even though I went in leaning toward Relais (they just aren’t ready but to be honest none of the solutions were there yet). Our web programmer, Danny Bouman, and I got our Staff Intranet ready for Halloween. Wish I had had time to change all the blue images (wish it had been css instead much easier to change) but alas I could not. …or maybe not. Today was International Talk Like a Pirate Day! Who knew. Obviously a couple of my co-workers, Danny Bouman and Donna Metcalf, did. After a bit of bantering back and forth about it I logged into Friendfeed or should I say Frrriendfeed. At first I thought this had all escaped Google’s attention but I should have known better. They didn’t make it the main search page but they did include Pirate as one of their language pages. It has been annoying (at first because everyone has changed their screen names so it was hard to figure out who was posting what), a bit fun (taking the pirate quiz gave me more than a few good chuckles), and a little musical (what else does one listen to today than Gilbert and Sullivan’s “Pirates of Penzance“. Be grateful that I didn’t write this all in pirate speak.